Need advice about a specific Ford C-MAX problem? Chart based on 213 repairs. 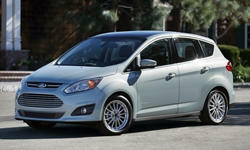 See TSBs and recalls for the 2013 Ford C-MAX. Chart based on 108 repair trips. The repair cost chart excludes repairs made under warranty, do-it-yourself repairs, and repair trips that include maintenance. See repairs for all Ford C-MAX model years. 6000 mi Outside temp sensor wasn't working. Dealer diagnosed that sensor had gotten wet. Sensor was dried and reinstalled. No parts replaced. Jan 2015 Sync system would no longer display name of artist or radio station tuned to accurately. They replaced head unit under warranty. 16800 mi ABS wheel sensor needed to be replaced. Warranty item. US $75 Thermostat failed on Christmas Day on way to grandma's house. Jan 2016 Loud whining sound coming from engine compartment. CEL determined it was coming from hybrid system as well. Turned out to be both the hybrid and transmission systems both needed replacing. 126000 mi TSB to replace door latches to prevent doors from opening by themselves. 22400 mi Right rear parking brake cable worn and fraying Noise in front shocks over large bumps at low speed. Known issue with outstanding TSB applicable. 27000 mi MG2 bearing failed. Entire transmission replaced. Took 5 weeks to find replacement transmission. Fuel pump failed. Took three weeks to find replacement part, eventually had to be sourced from Australia. 38000 mi Dealer had scratched driver's window and outside window trim performing door latch recall. Window and trim replaced. US $260 Ford radio was freezing on screen; apparently needed a deep reset. Also, two recall repairs were carried out. 19000 mi Fuel injectors became faulty, and car sputtered. This was a warranty repair. US $4 Issue: Rattle coming from the passenger side A-pillar. Repair: I removed the washer fluid bottle and used HVAC tape to tape down the washer lines that go up the A-pillar to the rear wiper. 5 minute repair. 20700 mi Vehicle odometer no longer accurately accounting for electric vehicle miles. According the Ford, the odometer is still counting overall miles so it is fine. Dashboard dimmer fails to retain user settings. Dealer applied SSM 44699 update to gauge cluster. Update failed to fix the issue. 26900 mi Dashboard dimmer fails to retain user settings. Dealer replaced the gauge cluster and applied software updates. Repair failed to fix issue so the customer was told "You're going to just have to deal with it." 12 volt battery could not hold a charge. Dealer at first claimed that they tested the battery/charging system and that everything was OK. Vehicle would not start when customer returned for pick-up. Battery was replaced under warranty. US $35 Both front stabilizer bar end-links were knocking while going over bumps/rough surfaces. Replaced both with Moog end-links. Noise has been mitigated. 39000 mi Hard start with a noticeable knock causing a flashing check engine light. Computer threw P0302 (Misfire on cylinder 2). Dealer determined to be a faulty fuel injector. Injector was replaced under warranty. Looks to be about $30 for the injector and about half an hour of labor with basic tools for a DIYer that is out of warranty. 46000 mi Computer system can no longer tell how long it will be for a complete charge of the plug-in battery pack nor can it schedule timing or preset climate conditioning. Dealer verified the issue and said that they have no solution for it. I ended up buying a digital timer on Amazon that can handle setting my charging times for off-peak electricity as well as the amperage required. I do miss the preset climate conditioning for these cold mornings. US $375 Both rear shock absorbers were failing to provide sufficient damping force and caused cupping of the rear tires; replaced both with KYB shocks. Also put on adjustable upper control arms to reduce the factory -2.4 degree camber which was causing accelerated inner tire wear. US $12 Bulb plug burnt out. US $150 New battery needed. Car had to be jump-started on a few occasions. No warning showed up, had to take the car in to get it diagnosed. 16500 mi Stabilizer end link replaced. US $90 Sway bar linkage replaced. 108000 mi Charging port led circle failed. Ford replaced under warranty. US $100 Car would not shut down. Had to be jump started & reset at selling dealer, CarMax. 41000 mi Horn wasn't working and was replaced. 33000 mi Carpet started to come off in the rear. The carpet is glued to the rear panels in some places, and the glue lost its bond to the plastic panels. Simple fix, just had to re-glue the carpet. 14000 mi System had a glitch in the computer software that had to be reprogrammed. Also had a seatbelt sensor that was not functioning properly. The days were because had to wait for a replacement part. They gave me a new loaner car during that time. 30000 mi Carpet trim inside fell off the folding rear seats in the trunk/hatchback area. I guess they glued them back on. There was a service bulletin. I also took the car in for a recall. 31000 mi Wiring repaired. Assess driver door misalignment. Dealer sent photos to Ford. 34000 mi Front sway bar links worn and rattling - replaced. 35000 mi rear shocks replaced, which temporarily eliminated minor rattle. Since then rattle has reappeared. May be rear stabilizer bar end links. US $35 Replace 2 rear sway bar links to fix rattle. 28000 mi Courtesy FoMoCo notification of problems with vehicle not starting after extended non-op. New battery installed, 3 systems flashed. Left Strut Bearing replaced due to noise when operating over bumps Floor ambient lighting inop rear driver's side, rear vent vane broken. US $16 Persistent body rattle, dealer unable to locate/repair. 31000 mi Dealer unable to locate rattle, but acknowledged there is one. Second dealer to look at car, turned over to Ford customer service. 39000 mi Engine mounts failing leading to loud rattling sound when engine is running and vibration in the steering wheel. 39700 mi Engine mounts were replaced under warranty. 43500 mi Recall on door latches that may fail. Door latches replaced. 800 mi Rear hatch is out of alignment due to motor fault and parts have been ordered. US $120 Ford My-Touch voice controls stopped working. Took to dealer and service adviser suggested I make a service appointment to fix. She didn't bother to tell me I could do a "system hard re-boot" myself, which is all the dealer service tech did. US $670 Replace all 4 brakes and rotors. Technician said the brakes went bad early because the car sat at some point before I bought the car. US $950 Complete brake replacement on all four wheels. US $700 Rear rotors really bad. Replaced all rotors and pads though. 24070 mi The mechanic tried to adjust a rear window trim panel that was improperly installed at the factory. It's still imperfect, but I think the whistle is gone. US $18 Left, front turn signal bulb. I was in and out in about fifteen minutes and the labor was $11.50. I wish I would have watched because the procedure description that I read sounded difficult. 18000 mi Carpeting in cargo area behind rear seats was loose. Dealer used spray trim adhesive to re-glue loose pieces back in place. US $250 USB port and 110V outlet inside the car were nonfunctional and were fixed. 50000 mi Car has had intermittent problems being dead in the morning. 12V accessory battery was previously replaced so unsure if this is a different system or not. US $37 GPS module had to be replaced, she never knew where she was. Back hatch had to be worked on so it would latch properly. US $50 12v battery was unexpectedly dead overnight. Bought a charger and charged it and it's fine. Second time the unexpected dead battery has happened in 9 months. US $105 Hybrid cooling engine pump malfunctioned and had to be replaced. US $100 Engine cooling system failed again. Determined replacement cooling pump must have came loose and leaked coolant. Dealer claimed their error from previous install of new pump, but later problem revealed it wasn't their mistake. Radiator cracked and was leaking coolant - turned out to be actual cause of previous problems. Dealer replaced entire radiator & covered my extended warranty deductible cost. Said they would "take care of it with Ford" on my behalf. 93200 mi Carpet came unglued from rear hatch/back of rear folding seats - dealer glued back on (this is the 4th time they have reglued it for me). 17000 mi The 12v battery appeared to be dead but quickly recharged. Actually it was not dead but the control module had cut it out of the system. I found that giving the system a good 12+ volts revives the module. Dealer could find nothing wrong. 2000 mi Radio presets went away. Clock time had to be reset every couple days. Had to replace chip when the original one would not accept a reflash. 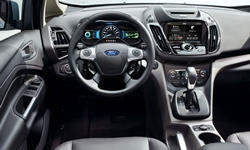 3000 mi MY FORD SYNC AND NAVIGATION UPDATED. COMPUTER UPGRADE. 27000 mi Since purchase I've had and reported many incidents of AUDIO OFF message and nothing works. Always No trouble found and the system would work for a while then fail. This trip they replaced the audio module and no failures for three weeks! 8000 mi Door seal wasn't put in right when the car was built. A/C vent close lever was sunken into dash and hard to turn. Update to MFT Liftgate does not close all the way when it closes by itself. Hand-free liftgate doesn't always open on first kick. Navigation sometimes has me several feet off from my current location. 10000 mi Power liftgate does not close all the way on its own. GPS shows me off location sometimes. Very loud. GPS shows me several feet away. 12300 mi Power liftgate does not close all the way on its own. Door chime recall. Chime doesn't sound when door opens. 30200 mi Door handle tray was loose. Carpet peeled off from cargo area. 10000 mi Experienced dead battery: easily jump started, dealer unable to determine/replace. Audio system freeze-up when parked in sun, dealer unable to resolve at this time. 21000 mi Audio fails to start occasionally, reprogrammed module. 23000 mi Defective module replaced. 8900 mi Periodically when I try to start the C-max I get the “yellow wrench of death” icon in the left instrument panel, associated with the car not starting. If I cycle through turning the car off and on about 3 or 4 times eventually the car will start. 45000 mi We found the car without power one morning. 2 day previously the radio had stopped working. The car was able to start with jumper cables, and was taken to the shop. "Nothing wrong" was the diagnosis, but "perhaps the SYNC system did not turn off, draining the primary battery overnight". Car seems fine now. 11000 mi rear hatch was not operating properly. 6400 mi Update to engine control computer for better fuel economy - allows electric only drive at speeds between 60 and 85 mph. Jan 2015 Headliner showed water stains. Dealer sealed the windshield and roof seams, and replaced the headliner. 2000 mi Battery dead. Battery recharged. TSB-13-5-1 performed. 8000 mi Defective air bag module. Restraint control module replaced. Sensor asembly - air bag replaced. 12000 mi 3rd dead battery. Also dealer did recall work. 18000 mi Car had engine oil change on 12/10/15. On 12/15/15 car was returned to dealer because splash shield fell down while driving. 23000 mi Tail gate would not release properly. Needed adjustment. Side door latch replacement done at same time. US $100 Floor carpet reattached. Door ajar light came on when there was no problem due to bad part installed for recall on door latch issue. 10000 mi SIgnificant body flex causes the doors to creak almost continuously. The dealer claims to have repaired this by lubricating the door seals, but the problem is not resolved. The doors creak as much as before the repair visit. Primary Controller Module that runs the hybrid efficiency needed a software update to improve fuel economy. US $331 Metal speaker cover on the top center of the dash rattles constantly because it's loose. Carpet in the cargo area separated from the plastic flaps that fold down when the rear seats are folded flat. The adhesive holding the carpet has separated from the plastic. Nov 2012 The Instrument Panel created a slow drain on the 12VDC battery causing the car to require being jump started in the morning. The dealership replaced the IP and installed a new 12VDC battery to correct the issue. Nov 2012 Check fuel filler inlet light came on. Replaced parts. 5000 mi Fuel filler inlets parts replaced again. 8000 mi My Ford Touch firmware update to correct system freezes and phone disconnects. Rattles in the front suspension, this is the 3rd time this has been reported to dealer with no successful outcome. 8200 mi MFT upgraded to v3.5.1, took a week to complete the upgrade. Rattles in front suspension remain unresolved. Dealer to replace sway-bar bushings. 9000 mi Relashed PCMs for improved fuel economy. 21500 mi Door chime recall. 2000 mi Reprogram ECU for better fuel economy. Update MySync to new version. Foot-activated liftgate doesn't always open. 16000 mi Battery dead multiple times. Car stereo came on by itself after car was off without key in ignition. Ford replaced stereo button, applied 3 computer program updates and replaced battery to fix problems. 21000 mi Heard noise while driving. Ford replaced CVT transmission to correct the issue. Was initially misdiagnosed as brake rotor and then wheel bearing issue, taking 10 days to correct. 3000 mi a/c didn't work; condenser replaced. 2300 mi Release cable for one of the rear fold-flat seats was defective or missing, so seat wouldn't fold. Dealer replaced cable. 11500 mi Loose trim on handbrake and luggage area cargo tie-downs. 17700 mi Car was dead in driveway - not even enough juice for the dome light. Jump-started it and drove it to dealer, who implemented a TSB (recall) for this problem, replacing the battery and reflashing the dash computer software. 10000 mi My check engine light has come on five times since I bought the car...most related to an evap code. Presently waiting for part to come in to have it repaired again. Can't remember dates and mileages, but took many trips for diag/repairs. 5000 mi Fuel Consumption Recall MFT was sluggish, freezing, not working at times The NAV system was not working correctly MFT Fixed NAV still not working The Central Computer was re-programmed - fuel mileage became better and the car became driveable. 28700 mi Recall for battery. 9000 mi navigation system failure. The GPS would track the vehicle incorrectly. Oftentimes the car was 100 yards ahead or to the side of where GPS reported it to be. Dealer updated software and resolved problem. 35000 mi Rear automatic hatch would not secure without manually pushing it closed. TSB applied. Door would work properly with interior door button but not with button on door. Car returned to customer this way. Claimed no adjustment possible. 36000 mi Reported to the second dealer that the automatic hatch would not secure without manually pushing it closed. Replaced entire mechanism. Functions properly now. Both trips took a full day in the shop. 32240 mi Two transmission, engine extracted three times, oil leaks, undetermined vibrations and noises, loud AC unit, unacceptable fuel economy, stereo doesn't work, dashboard lamp flash, GPS doesn't work. It was a continuous list of problems. 27160 mi Sync system would not work in heat. US $107 Repair Drivers seat warmer. US $122 Replaced Inside temp sensor with micro fan in it. The inverter wasn't the problem. US $44 Paint defect reported to Ford. Photos taken. Waiting for approval to repair under warranty. 9700 mi Brought in to complete the paint work, they had the car 17 days (scheduled for 3). Not completed successfully, and I will not be taking it back. DON'T BUY THE TRI-COAT METALLIC WHITE PAINT, it's a nightmare (and expensive) to repair. 20000 mi Main A/C fan was making irregular noises. A/C blower replaced under factory warranty. 29000 mi Restraints Control Module reprogrammed in accordance with Technical Service Bulletin (TSB) 14S21. Test 12-volt battery, inspect wiring, and update software module in accordance with TSB 15B04. Powertrain Control Module (PCM) reprogrammed in accordance with TSB 15E03. Carpet on rear of rear seats fell off and needed to be re-glued. 33000 mi Loud noise from HVAC system at all fan speeds. Same symptoms from a previous repair that required replacement of the HVAC module. Issue not repaired, as car was traded in. 36300 mi Battery would not hold a charge. 75000 mi Bracket that holds muffler mount broke. Parts clerk provided idea for self repair by drilling out mount and using a replacement bolt. 4000 mi There were a few intermittent problems, but a constant issue was the driver's window would reverse if you attempted to roll it up. Dealer checked grounds and reprogrammed the security computer and all problems were fixed. 24300 mi Clock on Sync screen was wrong and couldn't be set. The clock on the dash worked and could be set fine. 32000 mi recall, the one about fixing the programming for the computer programm on the display. interior panel of the rear passenger door (door handle, etc) came apart from the external door panel. I think the plastic pins that hold them together broke. Dealer fixed it under original warranty, but it required two trips. carpet in the trunk lost its adhesion to the floor/back of seats. Dealer glued it back on under warranty. See our lemon odds and nada odds page to see vehicles with no repairs or vehicles with more than three repairs. To see how frequently 2013 Ford C-MAX problems occur, check out our car reliability stats.